Appreciate a classic look and a durable knife at a budget-friendly price point? 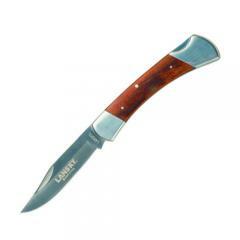 Lansky Sharpeners' Plain Edge Lockback folding knife is a great choice. The sturdy cutting tool features a high-quality, 420 stainless steel blade. Pins and bolsters strengthen stress points along the blade and handle junction, guaranteeing lasting durability. The handle is composed of polished laminated hardwood scales for a traditional look. The Lockback is easy to stow and carry with a reinforced, ballistic nylon sheath that includes a snap closure for added retention. Lansky's folder is large enough to offer impressive cutting power without the excessive weight of comparable knives.